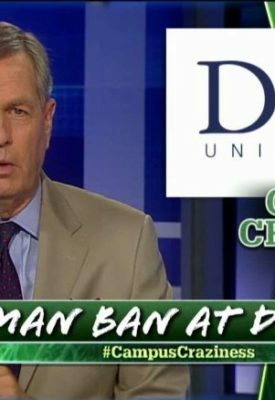 Britt Hume of Fox News runs a short segment each night during his show called, “Campus Craziness.” In the segment, he and his team cross the country looking at the more ridiculous rules and programs some of our universities have established. Recent titles from his segments reveal the craziness: “Male Duke Students Offered Safe Space to Contemplate Masculinity”; “University’s Hate Response Team Called To Investigate Offensive Christian Cross”; “American BBQ Offensive — New Jersey College Students Forced to Change Name of Cookout” … and it goes on from there. On the campuses of many universities in this country, academia common sense has fallen off the cliff. Young people today are not being taught how to think, but what to think and they don’t even realize it. Their parents don’t either. These young students in our university systems are not receiving a balanced education. They are actually receiving a one-sided education. According to Fox News, a recent study of faculty voter registration at some of our top universities found Democratic professors outnumber Republican professors by 12 to one. The study of 40 schools published in Econwatch also shows our universities have become more Democratic since 2004. In some journalism departments, there are 20 Democrat professors for every Republican professor. In history departments there are more than 33 Democrats for every one Republican. Brown University was ranked the most liberal with 60 Democrats for every one Republican and Pepperdine University in Southern California was ranked the most conservative with roughly an even ratio. Sadly, some of this “Campus Craziness” can also be found here in Mississippi. During the past couple of years, one of our main universities has put in place a number of questionable rules that are far over-reaching such as freshmen having to take a test during orientation to gauge how they lean in regard to race and a variety of other personal issues. These tests are intrusive. Some would even say by subjecting these students to said tests our universities are not being… “sensitive” or “understanding” to the student’s privacy. Our world has become too regulated, too sensitive, and too over-thinking. In my father’s day, the 18- to 20-year-old men of this country stormed the beaches of Normandy. Today, our 18- to 20-year-old men are worried if they have a “safe space” at their schools. As the craziness continues around the country, my hope is the alumni and large donors of our Mississippi universities will let their voices be heard and not allow this silliness to infiltrate and expand in our Mississippi schools.